The pop shuvit is an excellent beginner skateboard trick. It’s quite easy to learn how to pop shuvit and it’s none popping variant (the shuvit) can be learned without needing to ollie. Before we look at how you go about learning to pop shuvit lets discuss the difference between the pop shuvit and the shove it. 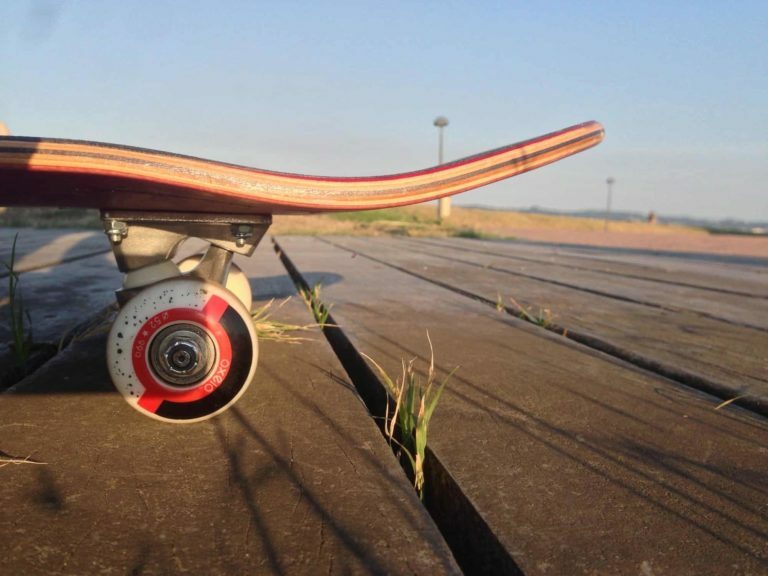 It’s quite simple really, the basic shuvit is simply a 180-degree rotation of the board beneath your feet and can be achieved by spinning the board below you rotating the board on its back axle. The pop shuvit has the same motion, but is combine with an ollie and therefor the board comes completely off the ground. The pop shuvit is the more advanced version and the one we’ll be looking at in detail. Backside pop shuv-its are so much fun! They can be used in so many ways! You can do them in and out of manuals, grinds and slides, you can do them down gaps, stairs and on flat blanks and anything else. They are a quick trick to learn, but they can be tricky to master! However, hopefully, the trick tips below can help. What tricks do you need to learn before a backside pop shuvit? The ollie is the base for every trick that pops. You need to know how to ollie and be comfortable with ollies before trying any other trick that pops. You can, of course, do shuv-its that do not pop, but if you can ollie, you may as well pop them, they are much more fun that way! 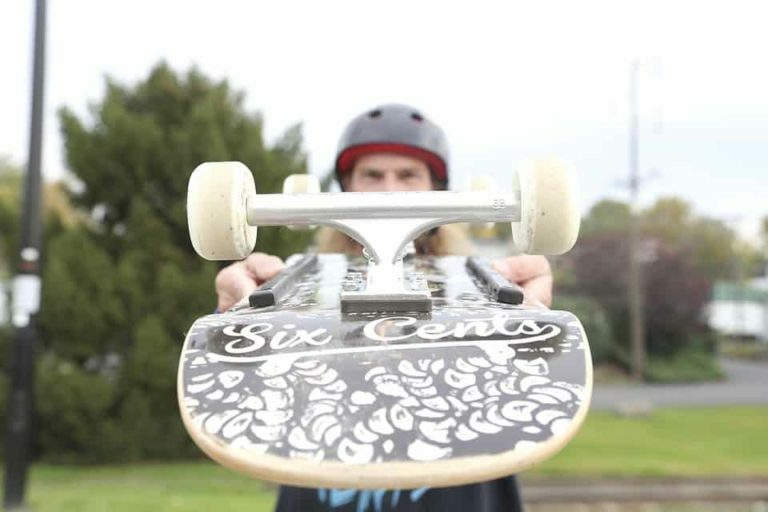 You also want to be comfortable on your board because pop shuv-its involve your board doing a 180 spin in the air. If you aren’t comfortable on your board, this may be extremely scary for you. Let’s take a look at the steps required to land a backside pop shuvit. The foot placement for backside pop shuv-its is the same as the foot placement for an ollie. You want your front foot just behind the nose bolts and your back foot in the middle of your tail. Popping a backside pop shuv-it is actually easier for most people than popping an ollie. This is because your back foot does all the work. Your front foot is just there to keep the board from flipping in the air. With your back foot, you want to pop down (as you would for an ollie) but you also want to push the tail behind you as you pop. These motions need to happen at the same time. So it is a downward and sideways movement at the same time. If you can already shuv-it but want to learn pop shuvs, it is the same motion as a shuv, but including an ollie. This is difficult to explain, but you’ll know exactly what we mean when you try it. A lot happens in the air with a pop shuv. You want to keep your front foot over the board as it spins, this is to make sure it only spins and doesn’t start flipping. If it tries to flip, it will hit your front foot, and this will stop it. You also want to be aware of where your board is moving to. Typically, backside pop shuvs move sideways. This means that you have to jump sideways to land the trick. If you are moving when you are learning pop shuvs, this jump with have to be forwards and sideways at the same time. Again, you’ll know exactly what we mean when you start trying pop shuvs. As long as you keep your front foot over the board when you pop and jump the right way, landing a shuv is actually the easy part. The board may come up and meet your front feet in the air, and so all you have to do is put your back foot back on the board and roll away. If you are struggling to land your pop shuv-its, you may not be jumping to the side enough. This is a common thing with pop shuv-its, you just need to commit to the jump and know that your board will be there. If you need some extra help learning the pop shuvit, then this tutorial should help you. There you go, that is how to land a backside pop shuv-it, go give them a go. They are a really fun trick and can help you learn loads of other tricks! While you are here, we may as well tell you about the backside shuvit’s difficult older brother, the frontside pop shuv-it. Backside pop shuvs are certainly easier to learn than frontside because everything happens in front of you, but frontside ones are fun because they are scary! So, if you like a little fear mixed in with your tricks, frontside pop shuvs are the trick to learn. Frontside pop shuvs are a trick that split skaters. Some people love them and perform them beautifully. Other people (like ourselves) aren’t fans and pop them very awkwardly. 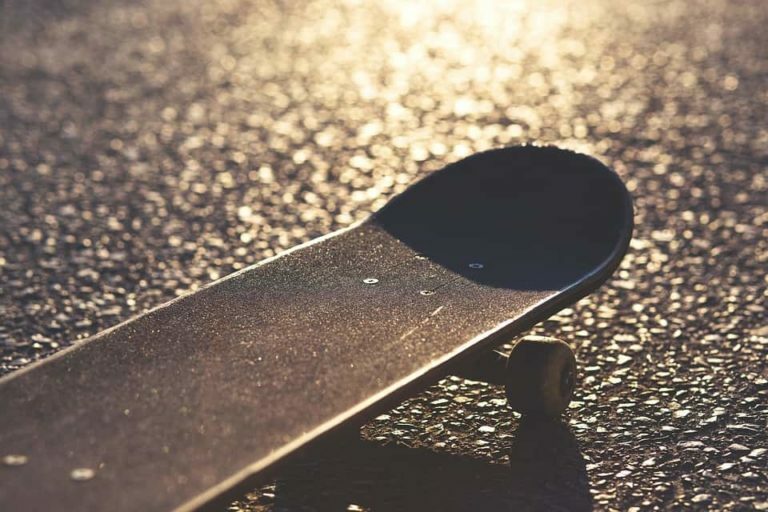 Although we aren’t fans of frontside pop shuvs (probably because we can’t do them as well as we’d like), we can teach you the ways of frontside pop shuvs. They aren’t too tricky to learn; they are just a little scarier than their backside brothers. What tricks do you need to learn before a frontside pop shuvit? Although it isn’t crucial that you know how to do backside pop shuvs to do frontside ones, it can help, as they move in very similar ways. Backside ones move in front of you, so it can help to know how backside ones feel so that you can understand how the board is moving when you try frontside pop shuvs. Foot placement for frontside pop shuvs is a weird one. There are many different positions for your feet when it comes to frontside pop shuvs. Here is where we put our feet. You may find another position to put your feet that works better for you and that is totally okay. Just be prepared to play around with foot position for frontside pop shuvs! We put our front foot behind the nose bolts with our toes hanging over the edge of our board. With the back foot, we put our toes on the tail almost in the little pocket of the concave but just shy of the pocket. Please see the picture for a better explanation! Popping a frontside pop shuv is relatively easy. If you can backside pop shuv it, it is the same motion only the board goes behind you. As you pop your ollie downwards you also want to push your foot out in front of you. This causes the board to spin behind you. Our front foot doesn’t do too much work at this stage, it is just there to keep the board in line with the ground and stop it flipping as it spins. While you’re in the air with a frontside pop shuv, you’ll notice that it spins behind and away from you. This means that you want to jump back as you pop. As you get more comfortable with frontside pop shuvs, you can learn to pop them high enough that the spin happens directly underneath you and so you won’t need to jump backward. However, to start with, you’ll want to jump backward to meet the board as it finishes the spin. Landing a frontside pop shuv is quite simple, all the hard work is over with. Once you have popped it, spun it and jump backward, you should just naturally meet the board as it completes the spin. If you aren’t doing this, you may not be jumping backward enough, spinning the board enough or committing enough. We know that committing to tricks that spin behind you is scary, but you need to trust that you are doing everything correctly and that the board will be there! Well, there you have it, that is how to do backside and frontside pop shuv-its. Go and give them a try and practice, practice, practice. These are the basic tricks that will help you so much when it comes to learning other tricks. They are so much fun to learn and will be tricks that you’ll enjoy doing for the rest of your life. Don’t forget to check out the other trick tips we have on the site to learn even more. 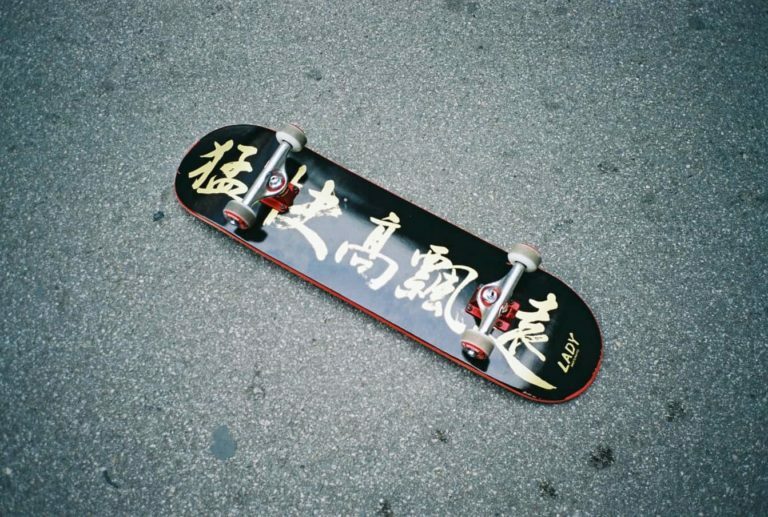 We also have lists of the best boards, trucks, wheels, bearings and more than the skate world has to offer!